What is everyone using to store there grease on the car for filling grease cups and other maintenance items. Is a grease gun a good item to have along for the ride verse just using the fingers to fill the cups and wiping on other items? As a rule my trips are less than 100 miles round trip so I grease before the trip and leave the mess in the garage. 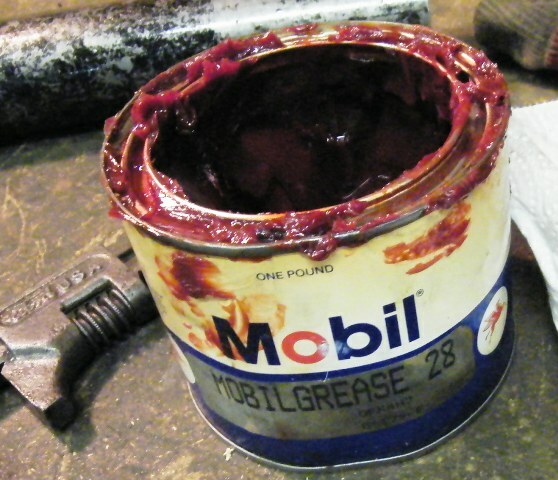 I can't imagine a small tin of grease with a plastic cover being much trouble. I would wrap a gun in plastic or put it in a garbage bag to prevent a mess. I am leaning toward the small Tin approach to bringing the Grease along in the car but was wondering if a gun might be needed somewhere for some reason or at the very least a good way to store the grease. Perhaps it could be used just to fill the Grease Cups too. 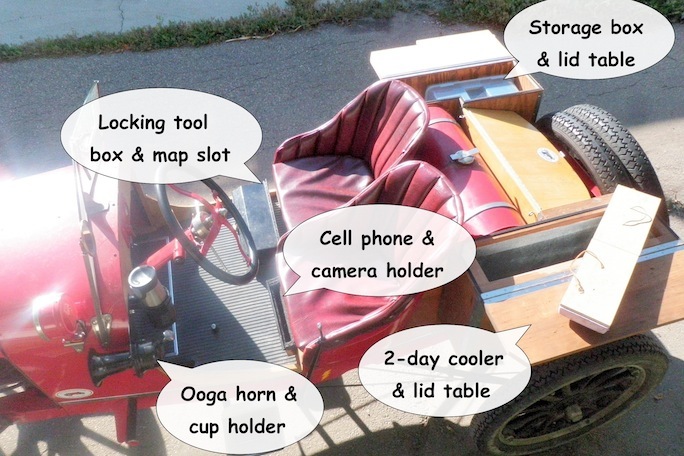 I know the Model T does not have the Alemite fittings but it might be handy. Adam -- The vendors sell grease cups with zerk fittings in them for use with a grease gun. The cup's cap hides the zerk. You can make your own using a drill and a 1/8" pipe thread tap. Adam: the small cups will take a 1/8" NPT tap with no drilling. I've done a dozen of them. Use the short 1/8" thread zerk and the cap fits right back on. Remove them first to clean the chips out. I going going to stick with the original grease cups on this car because of originality and the fun of using them. Doing that, is there any reason to have a grease gun besides storing grease or keeping your fingers clean by using it to fill the cups? Should cake be eaten with the fingers? Answer - No the fingers should be eaten seperately. On the serious side I just do the periodic greasing when the T's in the driveway since none of our driving amounts to hundreds of miles at a time away from home. BTW: It's easy to get carried away using a grease gun to pump grease into the rear axle roller bearings using zerk or alemite fittings. Don't ask me how I know! Lets just say you'll find out how good your axle seals are, or not! Oil and grease it before your tour and before your next outing. I don't carry a grease gun or oil can. I use red wheel bearing grease in my timer. For most driving I agree, do it at home. 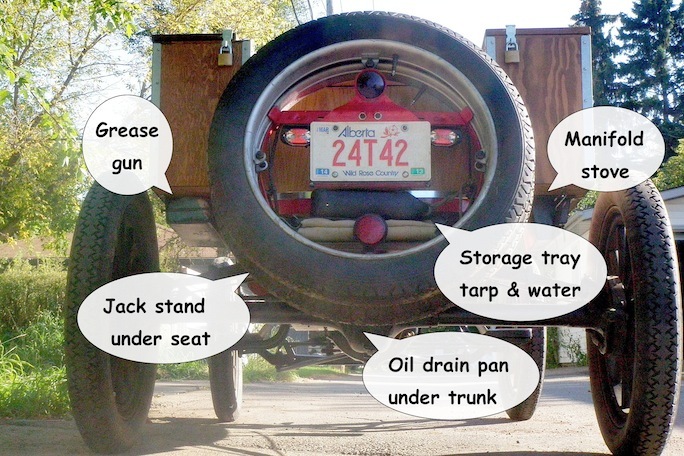 For a long trip, rather than taking up the space of a full can of grease I'd use a Bag Balm can or other smaller container. For cleanup afterwards, you can carry a fruit can to hold a little bit of gasoline from the faucet under the car, along with a small brush for washing parts. A roll of paper towels and a box of tissues are a good idea too. Grease is good for the skin, especially on cold damp days. Just use the finger and if any gets on the hand, rub it in! I have found that I can remove the grease cup covet, push the end of the grease gun into the base and give it a pump or two, then. A couple more pumps to fill the base and cap. The cup is full , ready for the next turn down later in the trip. The grease gun without zero is quite capable of injecting grease into the works. This is why I use a mini grease gun for the longer trips. About once a year our club has a longer tour of up to 1,000 miles over a week's time. Dale, That is not a bad use for the grease gun. Pre-inject the part then fill the cup. Probably not the solution you're looking for, but we added a variety of stowage to my '24 Speedster prior to an 1,800 mile road trip in September. The grease gun is wrapped in an old towel and slid into an open-backed sheet metal carrier under the cooler. 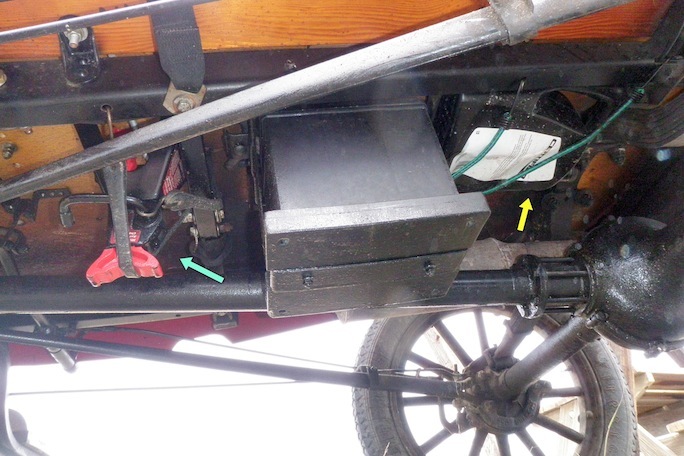 The long skinny bolt across the opening is held in place with a cotter pin. What oils and greases are you using? I just found some Mobile 28 and like it. I am working up a list of practical things to carry and for oils and greases I need a little help because of lack of experience. If you have or had a Ford Oil Can what would you put in it? Something like 10w/30 (Seems to Thin) or the other extreme, 600w. Here is my guess: Mobile 28 for the Grease cups and Bearings and the 600W for the Oil Can that oils all the oil flip tops? Also some timer oil. I am running the original Ford Roller Timer so it might have to be a separate thinned formula so the roller doesn't stick or bounce. 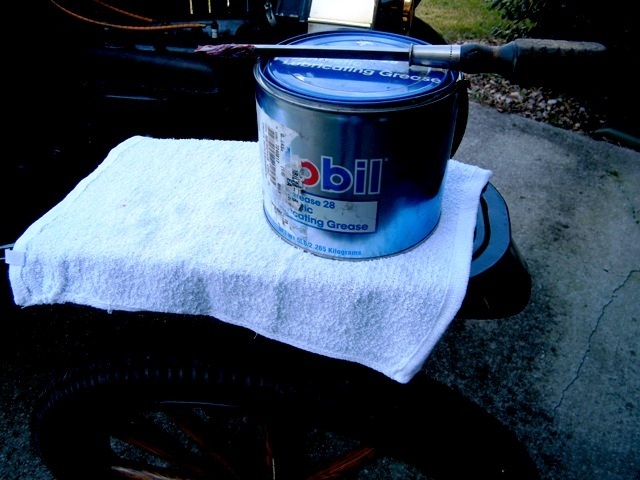 I used to have some Western Auto oil cans that were marked SAE 20 / Ford Model T. In a modern oil 5W-30 works very well all year if your ambient temperature is between 0 and 110 degrees F.
For shackles and other chassis oiling some folks use chain saw oil because it lasts longer than motor oil. Royce, where did you get the 1 Pound can? I have looked at Aircraft Spruce and Sky Geek but nothing but tubes there. I am an A&P / IA. I figured with the Mobile 28 pick and the attention to details. I am as well but just starting out. Lots to learn! Thanks for all the help. What would you put into the oil can for best use on the Model T. I figure I will be using the can for the Spring Top Cups and maybe the timer and Fan Hub.